A poignant and transporting cross-cultural love story set against the lush backdrop of the Sicilian countryside, where one woman discovers the healing powers of food, family, and unexpected grace in her darkest hour.It was love at first sight when Tembi met professional chef, Saro, on a street in Florence. There was just one problem: Saro's traditional Sicilian family did not approve of him marrying a black American woman, an actress no less. However, the couple, heartbroken but undeterred, forges on. They build a happy life in Los Angeles, with fulfilling careers, deep friendships and the love of their lives: a baby girl they adopt at birth. Eventually, they reconcile with Saro's family just as he faces a formidable cancer that will consume all their dreams. 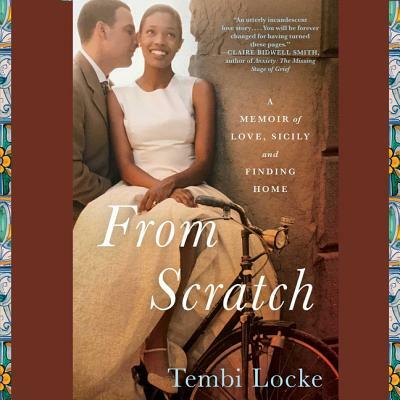 From Scratch chronicles three summers Tembi spends in Sicily with her daughter, Zoela, as she begins to piece together a life without her husband in his tiny hometown hamlet of farmers. Where once Tembi was estranged from Saro's family and his origins, now she finds solace and nourishment--literally and spiritually--at her mother in law's table. In the Sicilian countryside, she discovers the healing gifts of simple fresh food, the embrace of a close knit community, and timeless traditions and wisdom that light a path forward. All along the way she reflects on her and Saro's incredible romance--an indelible love story that leaps off the pages. In Sicily, it is said that every story begins with a marriage or a death--in Tembi Locke's case, it is both. Her story is about loss, but it's really about love found. Her story is about travel, but it's really about finding a home. It is about food, but it's really about chasing flavor as an act of remembrance. From Scratch is for anyone who has dared to reach for big love, fought for what mattered most, and needed a powerful reminder that life is...delicious.